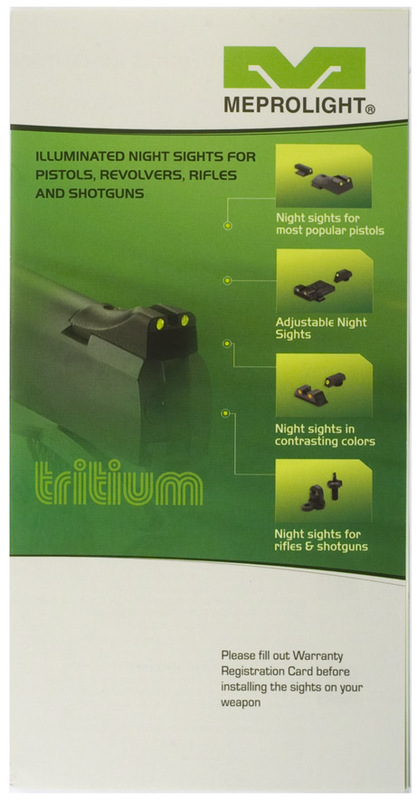 Meprolight offers night sights for over 135 different revolvers, pistols, shotguns and rifles. Two examples of older Meprolight packaging. 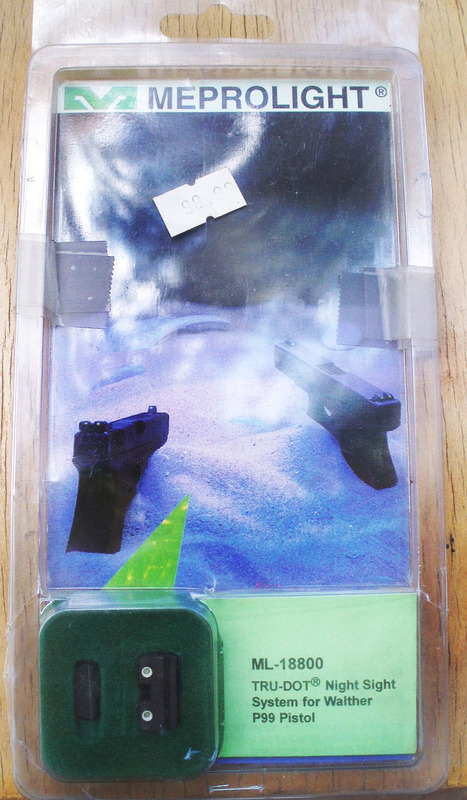 The Two Glocks in the sand packaging was used pre 2000 and would now be over a decade old. 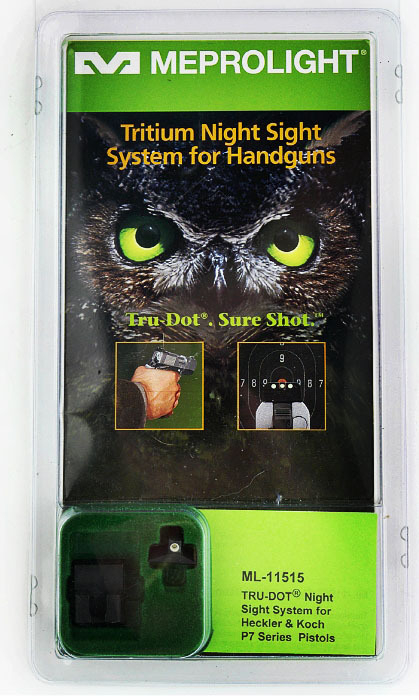 The Owl packaging was used from the early 2000`s until 2007 and getting older every day. If the sights you are buying look like these, be aware that at the are at least 6 years or more at the time of this writing. Green tritium has a half-life of about 12 years, meaning that half of it's potency has decayed after 12 yrs. 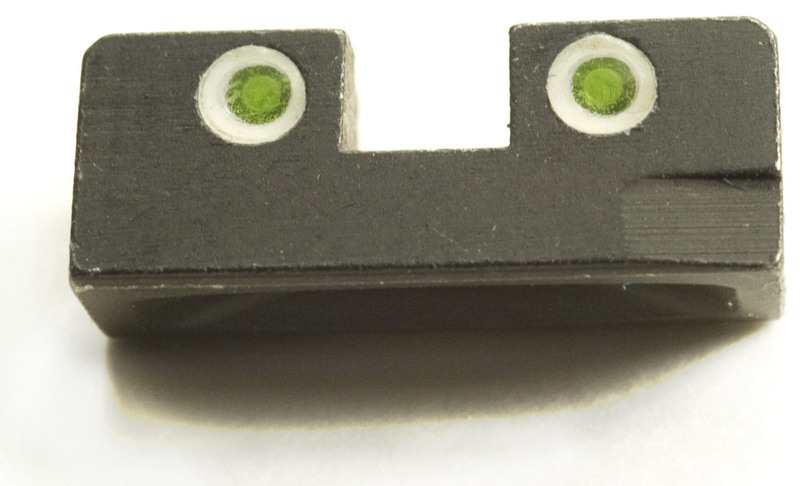 So the useful service life of green night sights is about 12 yrs. When they are half as bright as new they start getting dim and emit very little usable light. This is what the unopened current factory sealed Meprolight clam pack looks like. If you zoom in to the picture of the packaging you will notice that the clam pack is closed with 4 staples 2 on each side. If any of the staples are missing or deformed the package has probably been opened before. You cannot tell how old the sights are just by looking at the the packaging, but this packaging has been used since late 2007. With this packaging at least you know the sights are no older than 2007. The front, inside and back of the paper insert. 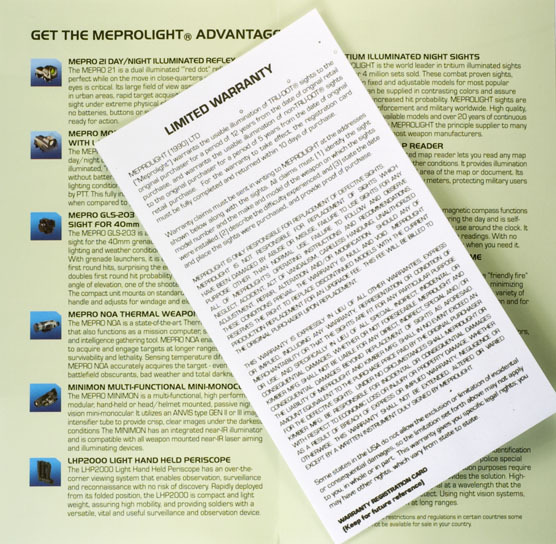 The inside includes descriptions of different products that Meprolight manufactures. 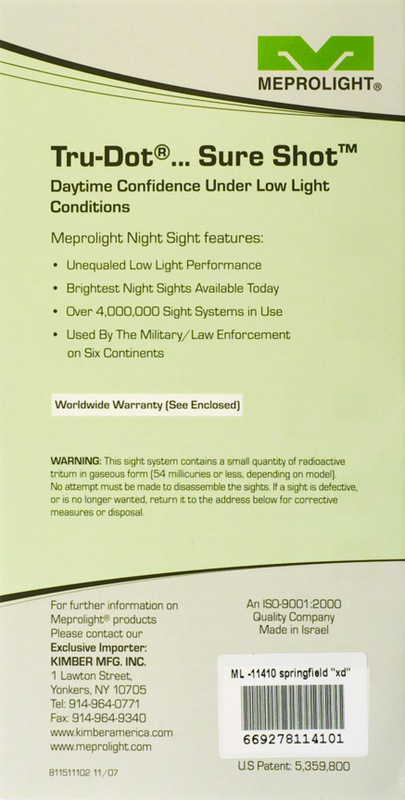 The back of the insert includes a radiation warning with a note not to attempt to disassemble the sights. An address in included for proper disposal. 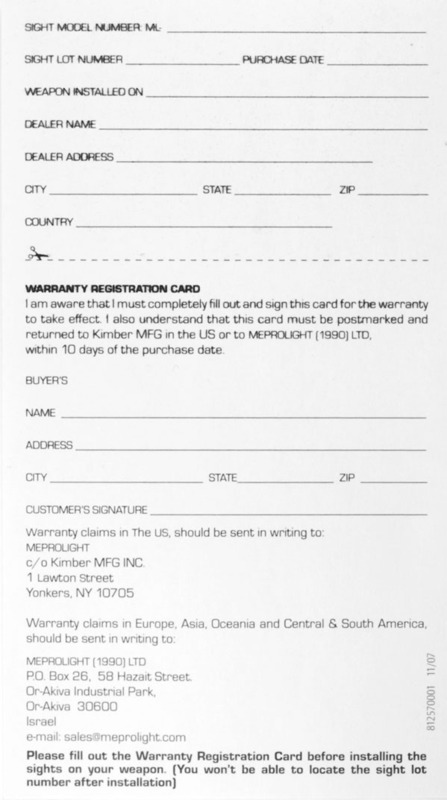 The warranty information is located inside of the main package insert. 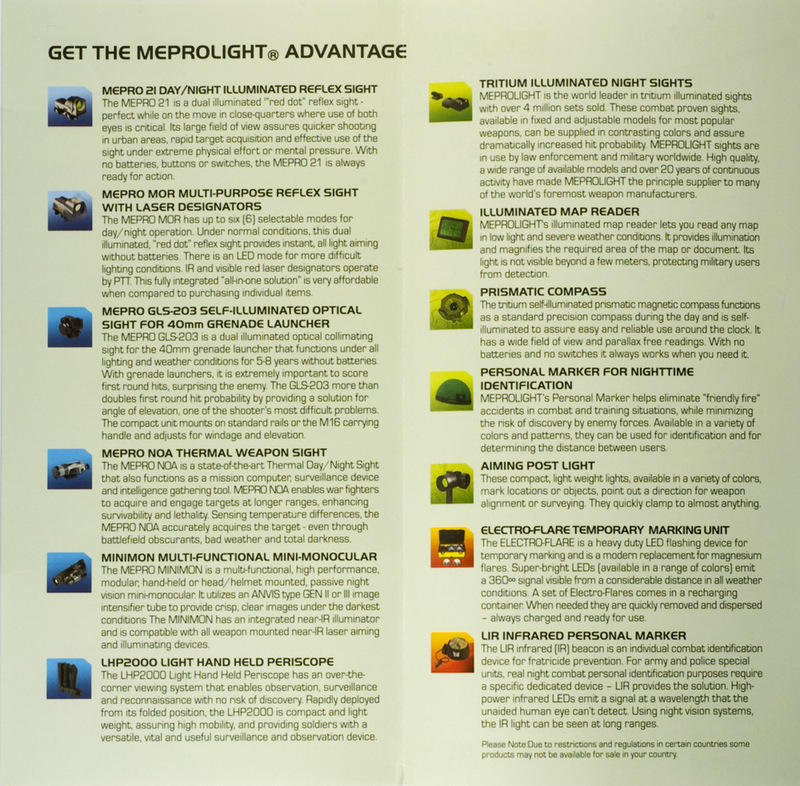 Meprolight lets you know that they warranty their sights to have a usable illumination for a period of 12 years. The warranty extends only to the original purchaser, and you must fill out the registration card within 10 days of purchase. The sight lot number is located underneath the rear sight and should be a letter or number. 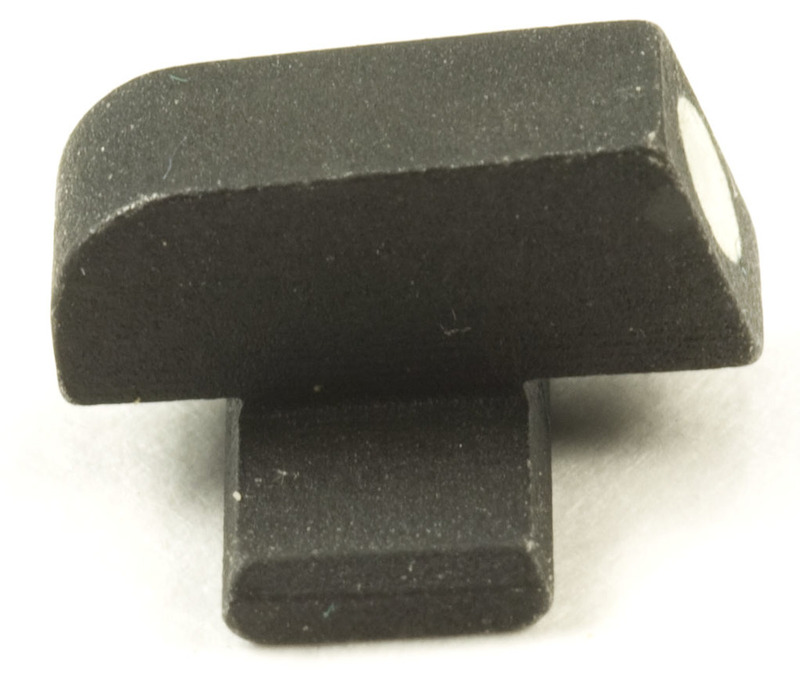 The sights are held by a felt covered plastic piece. The green paper is a folded insert that gives the sights model number, which pistol that sights fit and what color the sights included are. This insert will include an orange or yellow round sticker indicting what color the rear sights are. If no sticker in in place the sights are a green front and a green rear. As a note sometimes the paper is actually a different color and just like the sticker will indicate the color of the rear sight. The unfolded model number insert paper. This sheet gives some tips on removing the stock sights and then installing the Meprolight sights back onto your slide. 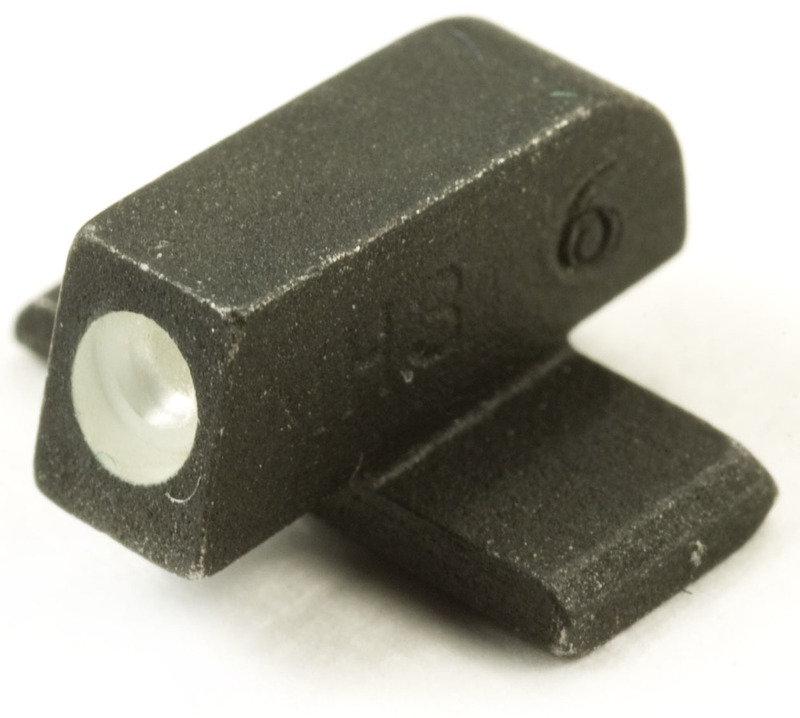 Meprolight recommends using LOCTITE 609 to glue the sights into place. I will note from my own experience installing sights on XD`s most have tight dovetails and will not require any LOCTITE. The front and top of the TRU-DOTS. 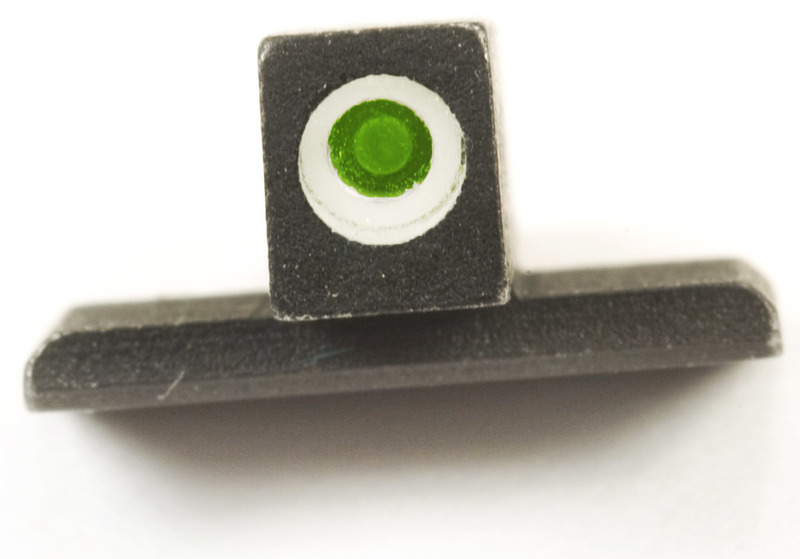 Notice the Nice white circle that surrounds the green tritium vials. These white outlines make it easy to use these sights during the daytime. The underside of the sights. Notice the letter that is stamped on the rear sight. This is actually a date code/Lot number. The “R” date code stands for 2009. The other thing to notice is the hollow base of rear sight. 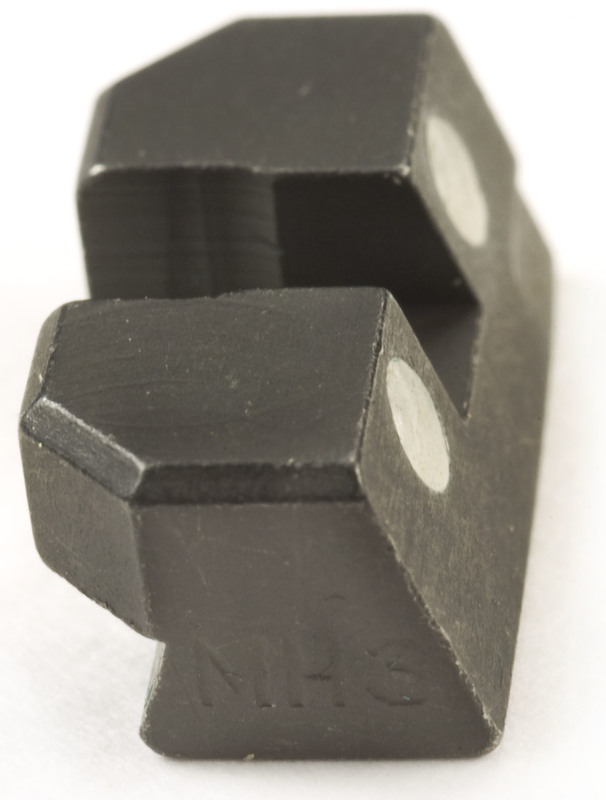 This hollow base acts like a spring and slightly collapses to fit the dovetail snugly without having to fit the rear sight or use locktite. Different views of the front sight. Notice on the right hand side the front is stamped with “MH3 6”. 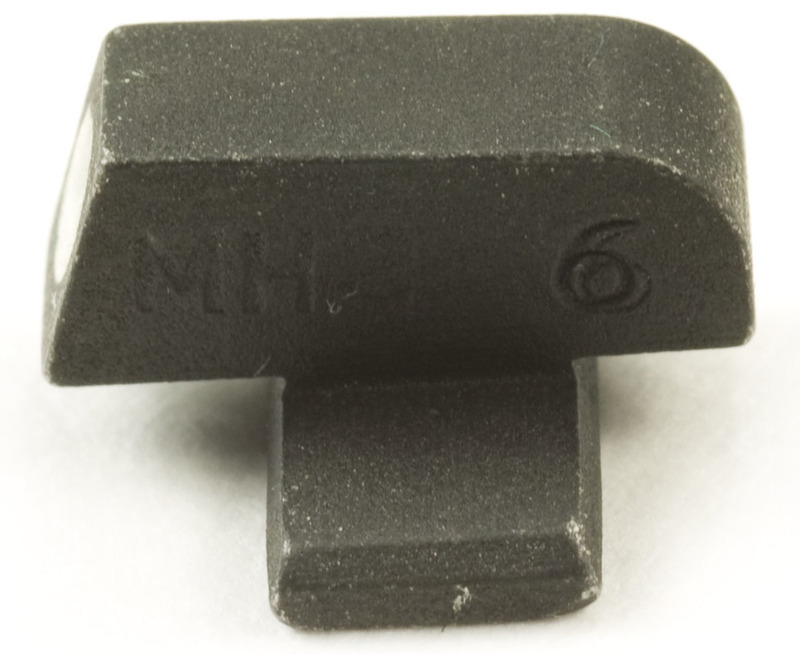 The “M” stands for Meprolight, the H3 is the symbol for tritium and the 6 is the size of the front sight. The Proper ones for all XD, XDM & XDS pistols for a combat sight picture should be stamped with a #8. The #8 will be the same size height as the factory front sight no matter the barrel length or calibre. Different views of the rear sight. Notice that the right hand side has been painted with the name of the sight ”TRU-DOT” and has been stamped with the number “8”. The number stamped on the right hand side designates the size of the rear sight. 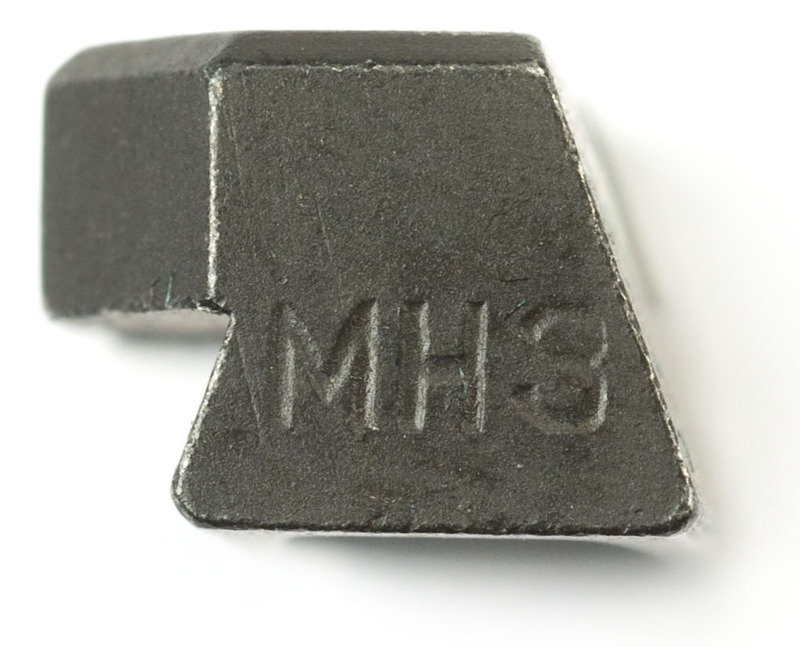 The left hand side is stamped with “MH3” the “M” stands for Meprolight and H3 the symbol of tritium. The Proper ones for all XD, XDM & XDS pistols for a combat sight picture should be stamped with a #8. The #8 will be the same size height as the factory front sight no matter the barrel length or calibre. If you found this article useful please consider helping us out by buying your sights or next install from us.